Needville is a city in Fort Bend County, Texas, United States. About 2,600 people lived into Needville as of the year 2000. 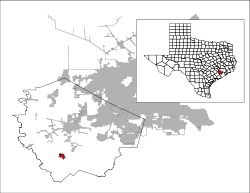 Needville has an area of 1.7 square miles. Wikimedia Commons has media related to Needville, Texas.